One week ago this evening -- almost at this exact moment -- right in the middle of rush hour, Minneapolis suffered from a tremendous tragedy when a span of Interstate 35W crossing the Misssissippi River suddenly came crashing down. Sadly, at least five individuals lost their lives and another eight are missing and presumed dead. While the disaster could easily have been much more lethal considering that over 100,000 commuters used the 40 year old bridge daily, the emotional toll that the bridge collapse has had on the Twin Cities is palpable. Monday morning, I flew into my hometown and was surprised when my flight into the city made an arch over downtown Minneapolis. I found myself with a view straight into the hell down below. From where I sat, it looked as though the bridge had been made out of a deck of cards, only to have fallen down. Of course, it was difficult from that height to see the human side, but a chill went down my spine nevertheless. 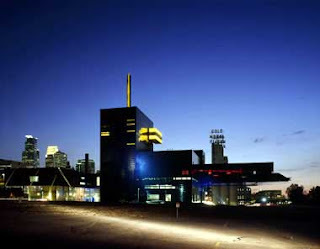 Fast forward to last evening, when I attended a performance of Private Lives at the stunning new Minneapolis home of the Guthrie (above, photo by Roland Halbe). The remarkable thing about the Guthrie is that it sits directly above the Mighty Mississippi and features a 173-foot long cantilever blade (on the right hand side of the photo) that gives the illusion of jutting out over the river. It offers visitors a beautiful panorama of the burgeoning life along the Mississippi, including where the bridge had been. In the days following the collapse, local authorites have limited access to last week's tragic scene to gawkers, and in fact have even arrested those who have had the audacity to cross police lines. Yet, if last night was any indication, thousands of local men and women are making pilgrimages to the site of the tragedy, hoping perhaps to make sense out of what occurred while also becoming witnesses to the carnage. Apparently, most are visiting the city's Stone Arch Bridge -- a former railroad trestle that's now used as a pedestrian crossing traversing the Mississippi. Having been to the Guthrie many times since it opened last year, it dawned on me as I entered the building for the show that it's proximity to the collapse may make it an unwitting host to hordes of gawkers -- after all, it did have that cantilever. While the traffic inside the Guthrie was extremely busy, it seemed about right given that the theatre has two concurrent productions running at the same time: the aforementioned Private Lives and a revival of 1776. Naturally, I could not but help look at the view. I felt goosebumps as I went into the fifth floor McGuire Proscenium Stage to see my show. The foyer for that particular theatre is encased in windows. There, down below was a largely unobstructed view of the bridge collapse. It was horrific. Then I found myself overcome with curiosity. It occurred to me that the theatre's Dowling Studio was located on the ninth floor (the yellow windows in the photo above), and since I had ample time before my play began, I took the elevator to the studio and found myself absolutely shocked by the devastation down below. I could readily see most of the bridge, as well as some of those images that have become ingrained in my mind -- the van belonging to the paraplegic whose quick thinking to steer his vehicle into the median most certainly saved his life, the school bus that contained more than 50 children who miraculously escaped with only eight needing vital medical attention; and the train that was literally stopped in its tracks when the falling bridge crushed a car. My heart practically stopped as I viewed the catastrophe from the safe vantage point the Guthrie offered. Not since seeing the carnage wrought in lower Manhattan in the aftermath of 9/11 have I seen something that so utterly shocked me and brought tears to my eyes. Of course, nothing can compare to the loss of life that day in New York nearly six years ago. But part of those tears I had last night were tears of relief that so many more lives that could have been lost are with us today to share their experiences that hopefully will lead to our government becoming more serious about repairing our infrastructure before countless others perish. My thoughts and prayers are with those who lost loved ones last week, as well as with the families and friends who hold vigil for those still missing. It's ironic that a building constructed to offer a breathtaking view of the Mississippi River instead becomes a window on a tragedy. Like you, I'm so saddened by the loss of life, but grateful that it wasn't worse. That's truly a miracle.